Regular Solar Panel cleaning is required for optimal performance. Pollution, traffic dust, leaves and even bird droppings contribute to preventing sunlight from reaching the solar cells in your solar panels. The more dirt – the lower amount of electricity they will produce. While many factors affect how much electricity your solar panels will produce. Dirty solar panels often is the biggest, and easiest to fix. The Cardiff Window Cleaning Company utilize the latest specialist solar panel farm cleaning equipment. We know how to clean solar panels farms safely and effectively. 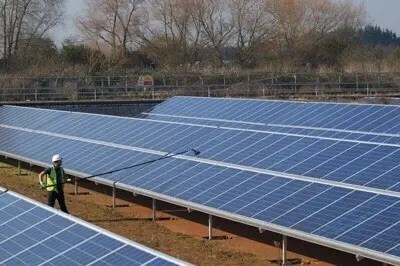 We have positioned ourselves so that we can offer a high quality, professional solar farm cleaning service at a cost effective price. A soft-bristled brush is used to lightly lift the dirt from the solar panel. Furthermore jets of ultra-pure water rinse the surface clean. Because the water is so pure, therefore it dries naturally without leaving any marks behind. Unlike mains supplied tap water or chemical based cleaners. This will also prolong the need to clean as regular because chemical cleaners leave sticky polymers behind which will attract air born dirt. Solar panel cleaning research is a subject under much discussion within the UK industry. Many more people are looking for evidence of the benefits that solar panel cleaning can bring. 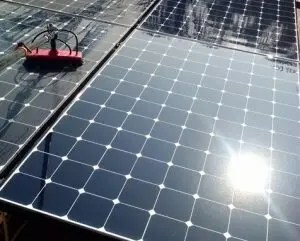 Our Solar Panel Cleaning technicians are equipped with the latest Solar Panel Cleaning equipment. Becuse of this our teams are able to clean thousands of Solar Panels. All with the minimum amount of disruption to your site. All of our staff are trained to ensure that we can provide high quality results. Whilst complying with the most recent health and safety legislation. Please feel free to review our Health & Safety information. Our staff are fully uniformed and insured up to £5 million. Providing you with peace of mind and reassurance. Please Contact us to discuss a Solar Panel Cleaning Programme specific to your project.